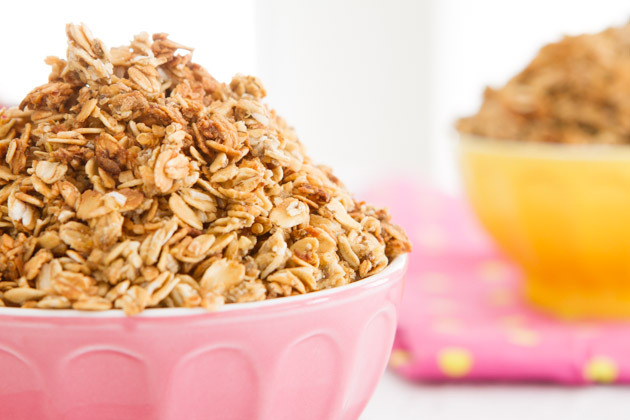 The Citrus Lentil Granola recipe that I shared last summer is the tastiest, most authentic gluten-free granola recipe that has come out of my kitchen. 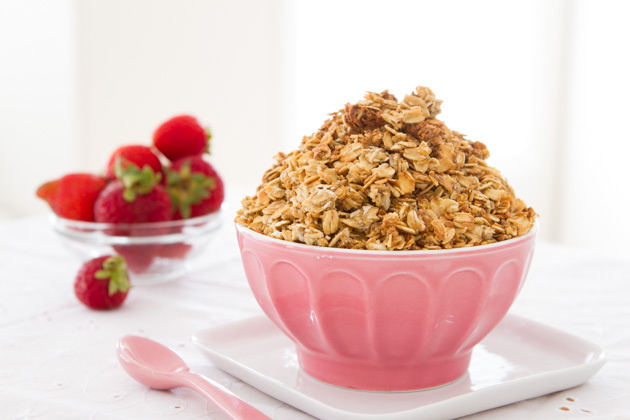 Adding sprouted lentils to your granola will be the coolest thing you ever do for breakfast. Or, at least it has been for me! I have made countless batches of the recipe since, adjusting it as I go using the ingredients I have on hand. But lately? I’ve been in the market for a new granola recipe. I’ve been seeing a lot of homemade granola that calls for egg whites and, while I think the high protein aspect of adding egg whites is cool, I just didn’t want to go there with my new granola recipe. Then, I thought to myself – why couldn’t I just replace the egg whites with chia eggs? 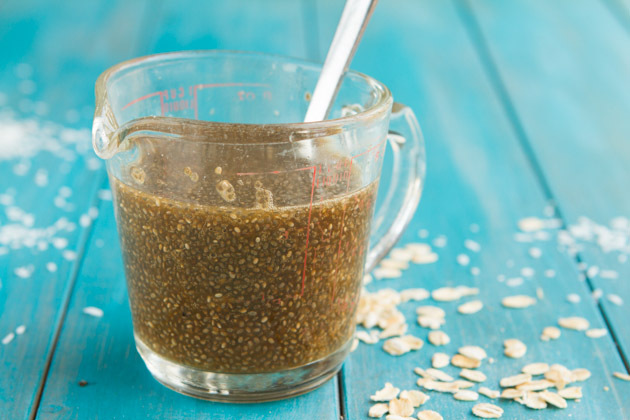 A chia egg is made when you soak chia in liquid and use it as a replacement for eggs in vegan baking. It works in most recipes, adding healthy fats, fiber and natural energy boosters to your baked goods. And (after testing a bunch of variations) I’m happy to report that adding chia egg to homemade granola works! 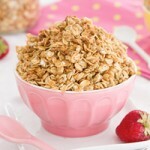 To create my new granola recipe, I decided to go with a base of rolled oats. 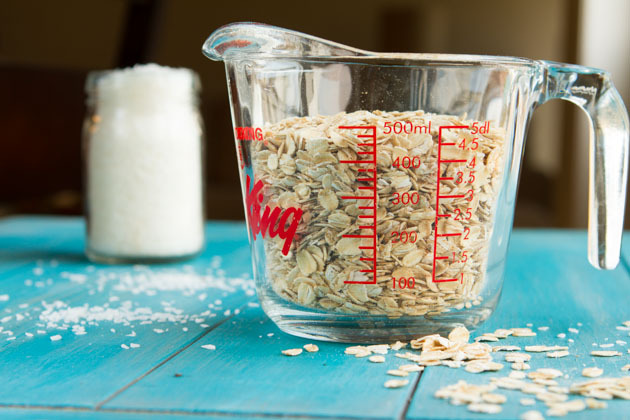 I used these gluten-free (uncontaminated) oats from Bob’s Red Mill. Then, I added in healthy fats with shreds of organic coconut. Instead of bulking up my granola with mounds of sugar, I juiced some apples and used it as the base for my chia egg. A couple of tablespoons of chia seed soaked in the juice for an hour, made for a super ooey gooey chia egg. I’m on a bit of a quinoa kick lately, so I added a heap of cooked quinoa in there, too. And, a new favorite granola recipe was born. 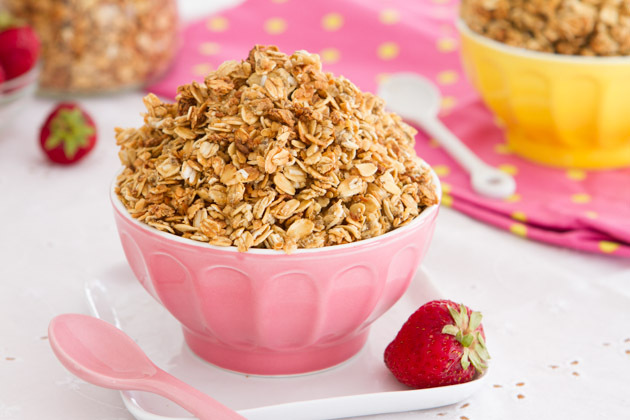 I hope you like this homemade gluten-free granola as much as me! It’s oil-free, very low in sugar, and vegan, through and through. Rotate the mix: at 15 minute mark, 30 minute mark, 35 minute mark, 40 minute mark, 45 minute mark, 50 minute mark. You need to rotate more frequently at the end of the baking process so the mixture doesn't burn. Store in an air-tight jar, in the pantry, for up to 2 weeks... if it lasts that long. You can also keep it in the fridge or freezer to extend shelf life. Flour: Although I haven't tested it, I think any flour would do well here. Brown rice flour, teff flour, even milled flax seeds. You will want to rotate the mix: at 15 minute mark, 30 minute mark, 35 minute mark, 40 minute mark, 45 minute mark, 50 minute mark. You need to rotate more frequently at the end of the baking process so the mixture doesn’t burn. 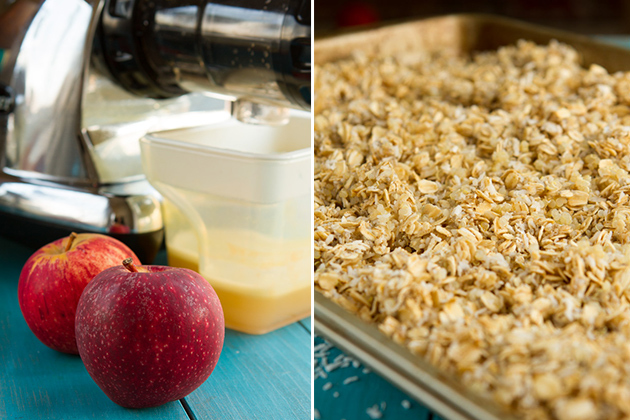 Once it’s toasted and perfect, remove from the oven and transfer to a cool baking sheet. Allow to cool for at least 1 hour. 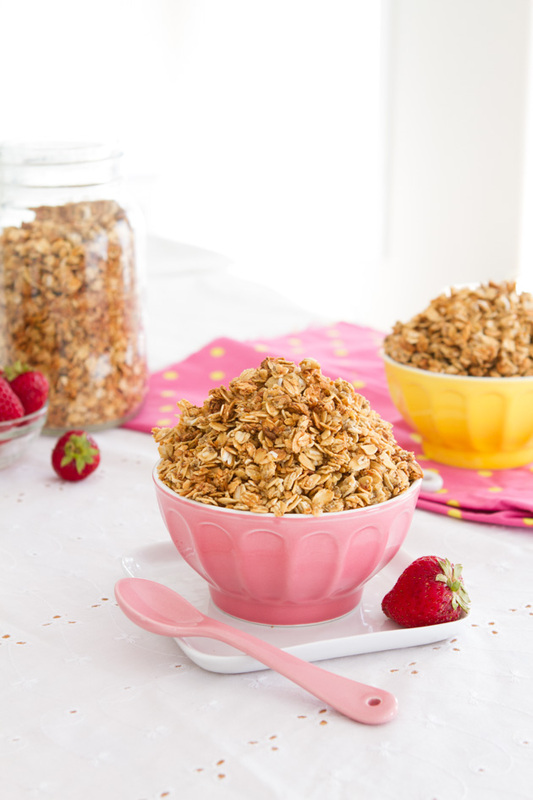 You can store your granola in an air-tight jar, in the pantry, for up to 2 weeks… if it lasts that long! Have you used chia eggs in your baking? Feel free to link up to your favorite recipes using chia eggs!